Roumania-born, Tunisia-based tastemaker George Sebastian in the 1930s. NOTE: This post was originally published in 2009 and has been updated with additional research. As further information becomes available, it will be incorporated into the text. Many thanks to an anonymous reader, who has alerted me to a February 1935 "Country Life in America" article about Dar Sebastian, which has supplied more details. I would also like to thank Med Mehdi Sahli and Julien Lévy for their contributions. Design history is populated by mysterious personalities—decorators who doggedly remain in the shadows, craftsmen of uncommon brilliance who left few documents behind, patrons who languish in obscurity despite their onetime prominence. Consider George Sebastian, for instance. A polyglot Roumanian with crystal-blue eyes and brilliantined hair, he put Hammamet, Tunisia, on the map in the early 1930s and built Dar Sebastian, one of North Africa's most admired residences. 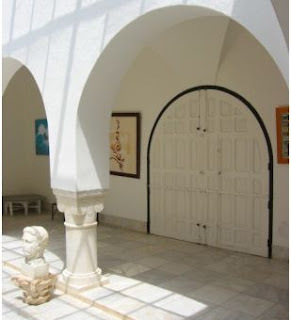 (It is now the International Cultural Center of Hammamet.) American poet Robinson Jeffers, in a letter to a friend in 1940, called it "the great Moorish house one always sees when a perfect house is pictured in architectural magazines." Until recently the details of Sebastian's life have been largely conjecture but an enterprising Roumanian scholar, Mihai Sorin Rădulescu, has cleared the fog. Karl Gheorghe Sebastian was born on 21 September 1896, in the city of Bacău, north of Bucharest. His father, Chiril Sebastian, may have been Russian; his mother, Moldovan aristocrat Maria Keminger de Lippa, was a baroness whose relations were stars of Romania’s glittering social goulash. Her half brother Prince Dimitrie Ghika-Comăneşti was a celebrated explorer, while another married the sister of Queen Natalie of Serbia. Princess Marthe Bibesco, the poet and novelist, was a relative; one cousin's wife was Liane de Pougy, the ravishing French dancer and grande horizontale, and Maria's nephew Prince Barbu Ştirbey was the lover of Romania's queen consort—and likely the biological father of her youngest child. By blood or marriage, Madame Sebastian and her son were connected to most of Roumania's consonant-rich, crème-de-la-crème clans, including the Mavrocodatos, Cantacuzenes, Ştirbeys, Sturdzas, and Lahovarys. Enveloped in an aura of power and privilege seasoned with Mitteleuropean exoticism, George Sebastian arrived on the international scene in 1918 or thereabouts and settled in the fashionable Paris suburb of Neuilly sur Seine, at 2 rue Frédéric Passy. For a while, he was employed as a clerk, and he traveled at least once to the United States, in 1924, in the company of Roumanian diplomat and banker Radu Irimescu and his American tannery-heiress wife. With the relocation from Eastern Europe to France, significant friendships developed. Sebastian fell into the orbits of interior designer Jean-Michel Frank and society photographer Baron de Meyer. Somewhere along the line he befriended the future Duchess of Windsor, either (says one source) during her youthful sojourn in Peking during her first marriage or (says another) through her second husband, Ernest Simpson. It was not, however, an unblemished association. As a letter Simpson wrote to his erstwhile wife attests, he was mortified when, at the Guards' Club, Sebastian "insisted on holding my hand throughout lunch," for reasons unknown. Perhaps the most intense relationship was with Porter Woodruff (1894—1959), an American artist, who designed covers for House & Garden and sketched fashions for Vogue. Records suggest they met shortly after the first world war. 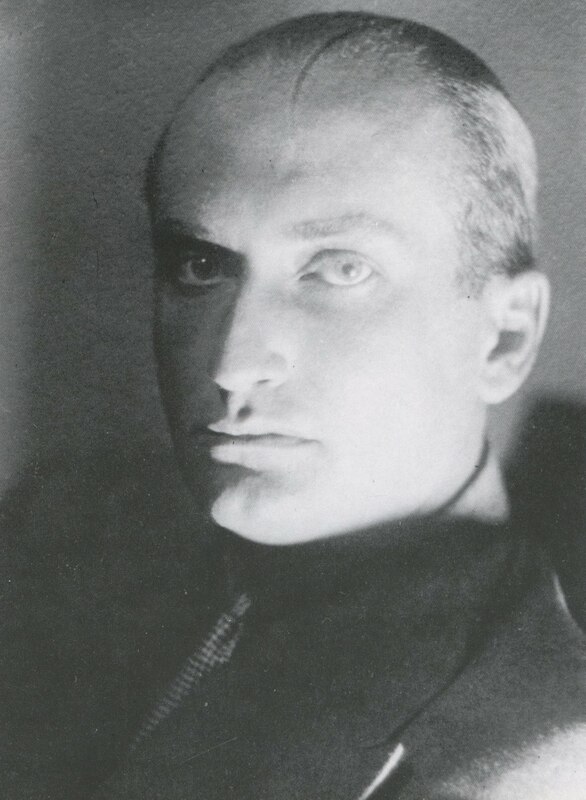 A biography of artist and costume designer Gordon Conway, a mutual friend, states that Woodruff was Sebastian's inamorato and that the two lived together in France and Tunisia. (Woodruff painted some strikingly attractive views of Hammamet as well as dashing scenes of North African life.) Affairs of the heart aside, the suave Roumanian formed a marital alliance in 1929 with Flora Witmer, an attractive American widow a couple of decades his senior. Fifty-two to Sebastian's 32, she swiftly shaved off a few years—seven to be exact—in an effort to reduce the chronological gap. Flora E. Witmer, the future Mrs George Sebastian, in 1922. 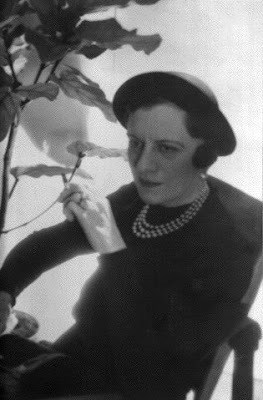 Flora Sebastian in a detail from an early 1930s photograph, likely snapped at Dar Sebastian, her winter residence in Tunisia. Image courtesy of a Stifel family member. How bride and groom met is unknown, though a chance meeting at one of Europe's watering holes wouldn't be surprising. More important is what the widow Witmer brought to George Sebastian's life: a great deal of money and an apparent willingness to allow him to spend it to his heart's content. A native of Wheeling, West Virginia, the former Flora Elizabeth Stifel (1877—1939) was an heiress to a fortune built on the manufacture of printed calico. The family firm, J. L. Stifel & Sons, was founded in 1835 by her paternal grandfather, a German immigrant, and it churned out millions of yards of indigo-dyed cotton a month. She also possessed, in comparison, a fleabite legacy from her first husband, Porterfield Krauth Witmer (1871—1920), cofounder of a Des Moines insurance and real estate agency. How Mrs Witmer amused herself during nine years of widowhood has yet to be ascertained, though it appears she spent some time upgrading her appearance. 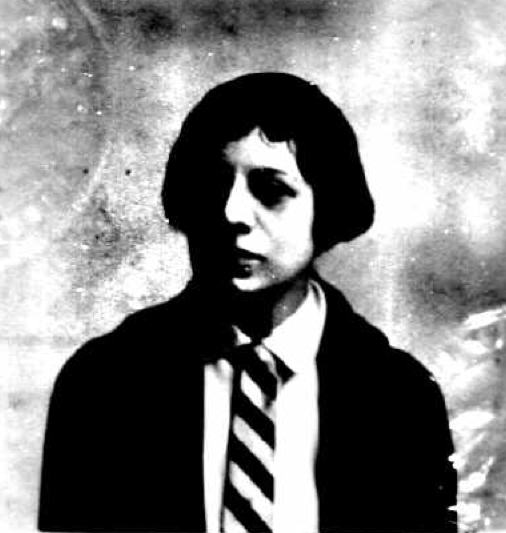 A 1922 passport photograph shows a glum-looking creature with an unflattering bob and wearing a blouse with an untidy collar and a mannish striped tie; about a decade later, the camera records a woman who is the very model of American chic, draped with pearls, her dark hair elegantly coiffed and crowned by a smart halo-brimmed hat. Somehow, somewhere Flora Witmer crossed paths with George Sebastian. And eventually, dear reader, she married him. One month after they sailed together to New York City from Cherbourg, aboard the Leviathan, Mrs Porterfield Krauth Witmer became Madame Charles George Sebastian on the evening of 23 November 1929. Following the brief Lutheran ceremony—held in, of all locations, Porter Woodruff's apartment at 230 East 50th Street—the newlyweds traveled to Canada for a honeymoon and, thence, to Paris, which would be their home base. Winters would be spent in palm-shaded Hammamet. The main entrance of Dar Sebastian, which was constructed circa 1932 by George Sebastian, with the assistance of a Sicilian builder, Vincenzo Dicara. The door surround is made of carved marble; on the roof is glimpsed a bit of Flora Sebastian's breakfast room. 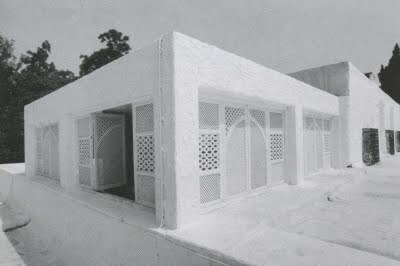 Image by David Massey from "Maisons de Hammamet" (Dar Ashraf Editions, 1988). 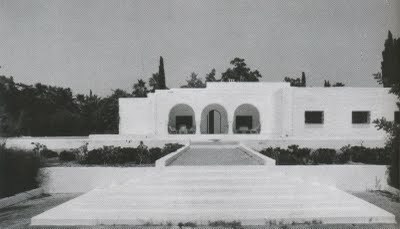 A 1930s photograph of the bay-side façade of the Sebastian mansion, which is made of concrete and stucco painted a blinding shade of white. Image by George Hoyningen-Huene. A 1930s view of the breakfast room on the roof of Dar Sebastian, which is walled with traditional mashrabiya panels; the interior of the space featured yellow cushions, a departure from the house's largely black-and-white decor. Image by George Hoyningen-Huene. Flora Sebastian at her winter residence in Tunisia, accompanied by a fox terrier. She is seated in what appears to be a classic Roorkhee campaign chair, versions of which are still retailed today, notably by Melvill & Moon. Image by George Hoyningen-Huene, French "Vogue," January 1935. Everyone from Wallis Simpson to Jean Cocteau gladly made the 40-mile trip from Tunis to Hammamet to bask in the Sebastians' hospitality. 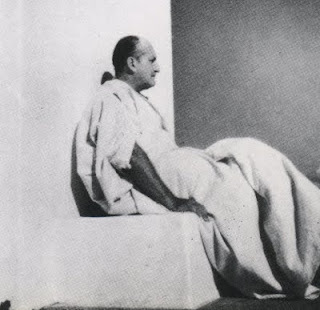 (Somerset Maugham and Greta Garbo came too, as did Cecil Beaton.) The photographer Horst, another Hammamet habitué, recalled being bedazzled by the Sebastians' "many handsome Berber servants." Among them, presumably, was the live-in cook, Sadok, a cleancut gentleman whose culinary expertise was the focus of an article published in American Vogue in August 1935; entitled "My Cook is an Arab," it extolls Sadok's skills, notably his way with couscous, chachouka (lightly fried eggs set atop chopped and cooked vegetables), and roast Tunisian partridge, which the article described as "remarkably plump ... with succulent white flesh, less gamy and more tender than the smaller [European] birds"). Meals at Dar Sebastian typically ended with fresh white or black figs from the garden, watermelon, or ice cream. The last-named confection was produced in a machine called an Economy Cream Maker, which the Sebastians proclaimed "a salvation ... for any one who lives in a country where the dairy resources are not of the best." 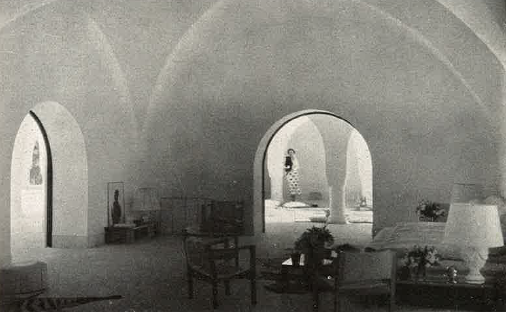 The couple's enjoyment of Hammamet was so enriched by their cook that, they observed in the Vogue article, "should any strange circumstance ever draw us from Hammamet it would undoubtedly draw Sadok with it, so integral a part of our household has he become." Prior to engaging Sadok, however, the Hammamet kitchen was manned by François Rysavy, the Czech-born chef of the Paris restaurant Au Danube Bleu, whom they hired shortly after their marriage. "Two automobiles were waiting for us when we got off the boat in Tunis," recalled Rysavy—later to be White House chef during the Eisenhower Administration—"and Sebastian chose to drive his Renault convertible himself, with his wife [who spoke no French] beside him, while I road grandly in the back seat of a chauffeur-driven Mercedes ..." (The driver was likely Sebastian's young Austrian valet and chauffeur, Franz Leitner.) The dish Rysavy's new employers loved most was the French classic Poulet Sauté Chausseur, or sautéed chicken with mushrooms and tomato sauce. The dish was the main course of a meal he created for Wallis and Ernest Simpson when they stayed with the Sebastians in March 1932. (Knowing the couple was strapped for cash at the time, their host sent them round-trip tickets, leading Wallis to splurge on a new linen suit. Ernest and his fourth wife, Avril, would visit the Sebastian house again after their wedding in 1948.) Presumably it was served beside the swimming pool, at that great black marble refectory table that Schiaparelli so admired and which was adapted from a Jean-Michel Frank design. When the Sebastians' guests weren't dining well—Rysavy stayed in their employ for several years, and the couple sent him to London to learn English, so he could talk with Flora—they were being inspired culinarily. Mary Oliver, a childhood friend of Paul Bowles' and the wife of a British department-store heir, stayed frequently at Dar Sebastian and came up with Stuffed Peppers Hammamet, which made it into The Alice B. Toklas Cookbook. The directions are as follows: "Boil barley in salted water until tender—it should absorb all the water. Mix with chopped onions and parsley. Fill green peppers with this mixture, cover with olive oil, and put in oven. Serve with sauce made of lemon juice and paprika." The living room, with chalk-white walls and vaulted ceiling and white marble floor. Armchairs designed by Eyre de Lanux were upholstered in white wool and gathered around a vast white divan that was flanked by white-plaster lamps with molded swags. The other dominant color accent in the house was black, in the painted door frames and window grilles as well as some furnishings. Alongside the divan, as well as standing in the far corner, are Jean-Michel Frank's Ananas low tables. A leather hassock and a zebra-skin rug can be glimpsed at the photograph's lower right-hand corner. Image by George Hoyningen-Huene for French "Vogue," January 1935. 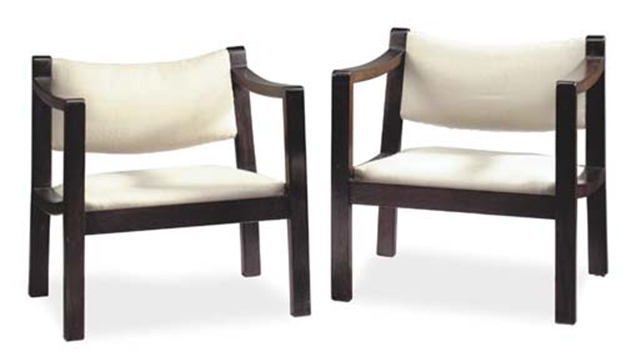 A pair of Eyre de Lanux armchairs. 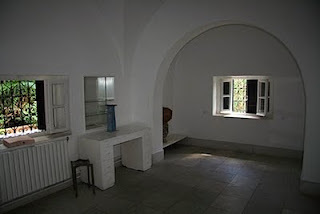 Multiples of the same model were purchased by Flora and George Sebastian for their Hammamet house. Designed around 1925, the chairs sold in 2007 at Christie's New York for $85,000. 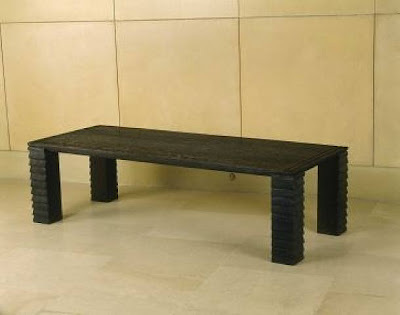 A circa-1934 Ananas low table by Jean-Michel Frank. Several were used throughout Dar Sebastian, though in raw waxed oak. Offered by Galerie Vallois, Paris. 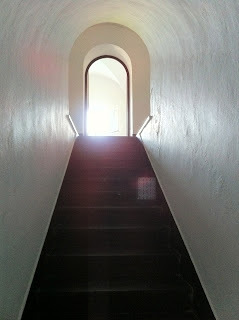 Image from Artnet.com. The living room of Dar Sebastian today. The doors at the left lead to the pool; the doors at the center open to the patio, and the door at right leads to the bay-side loggia. Image from Tunisia.com. The patio, strewn with zebra hides and furnished with leather hassocks, that connects the living room with the pool area. The glass for the ceiling reportedly was manufactured by Lalique. Image by George Hoyningen-Huene, French "Vogue," January 1935. The patio as seen today. 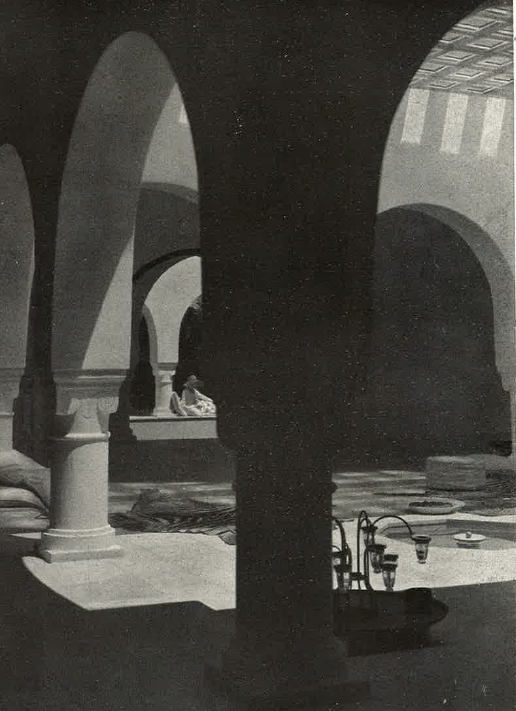 The column-and-arch sequences throughout the house were adapted from similar architectural details at the Great Mosque of Sidi-Uqba in Kairouan, Tunisia. Image from Sejurtunisia.ro. A scan of a Porter Woodruff illustration of the patio at Dar Sebastian. The work, presumably executed in the 1930s, is used courtesy of a Stifel family member. 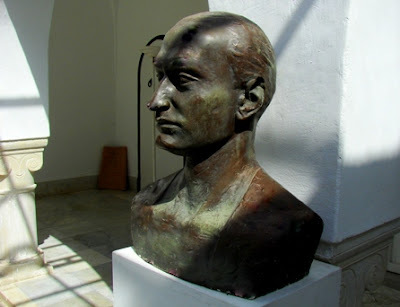 A bronze bust of George Sebastian, displayed in the patio; it has since been hideously polished. 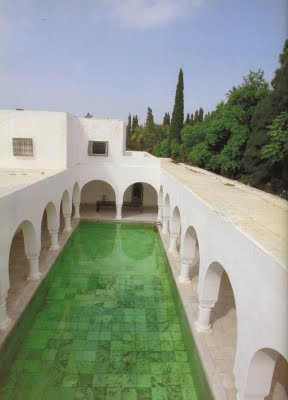 Image from the blog Hai-hui prin Tunisia. 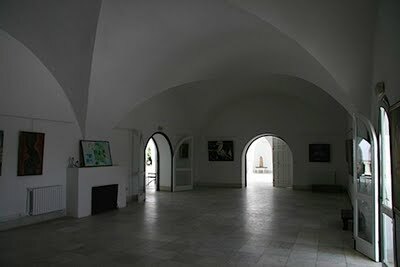 Though the house is almost entirely empty now, being used as a gallery and for receptions, a handful of original furnishings remain on the premises. There are several low oak Ananas cocktail tables by Frank, which when I last saw them were sway-backed by exposure to the elements. (I had the good fortune to spend a brief but fruitful sojourn in Hammamet more than a decade ago, but that’s another story.) That weighty poolside dining table remains in place too. Other Frank designs were purchased for the house too, including an upholstered stool paired with a dressing table (both pieces have vanished). The most extraordinary space is a ground-floor suite whose bath is centered on a sunken marble tub inspired by a sixth-century Paleo-Christian baptistry. Some observers have examined the tub's shape and size—four curved lobes, each with steps that could also serve as seats—and believed it to be a communal hot tub, a sort of hammam, where the occupants could submerge themselves in steaming water. It seems far more likely that the bath and adjoining bedroom and dressing room were the domain of Flora Sebastian (other bedrooms are located around the ground-floor patio). Perhaps the unusual tub and the mirrored double doors surrounding it are merely her husband's essay in Hollywood-meets-North-Africa extravagance, created for the American heiress who made it all possible. 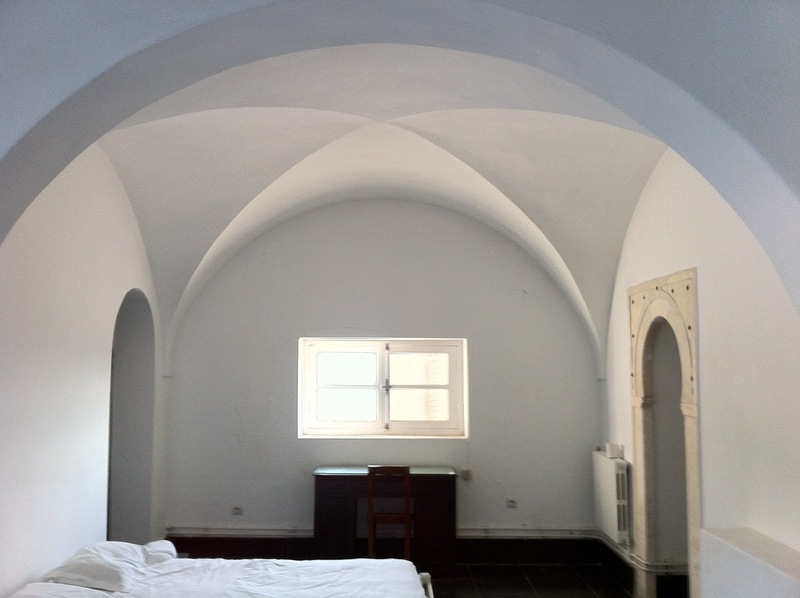 Upstairs, on the roof, is another master suite, presumably George's, overlooking the Bay of Hammamet. Paved with black marble, it is comprised of a large dressing room (its mirror-clad wardrobes and three-panel cheval glass are still in situ); a small bath; a bedroom with a six-door low mirrored cabinet stretching from one wall to another; and the previously mentioned lattice-walled space, used either as a breakfast room or a reading room. A black-marble staircase leads to the rooftop master suite. A groin vault crowns the rooftop bedroom; the marble-framed arch on the right leads to a small bath and the latticework room beyond, while the arch to the left opens to a mirrored dressing room. Just visible, in the lower right-hand corner, is the room's fireplace. 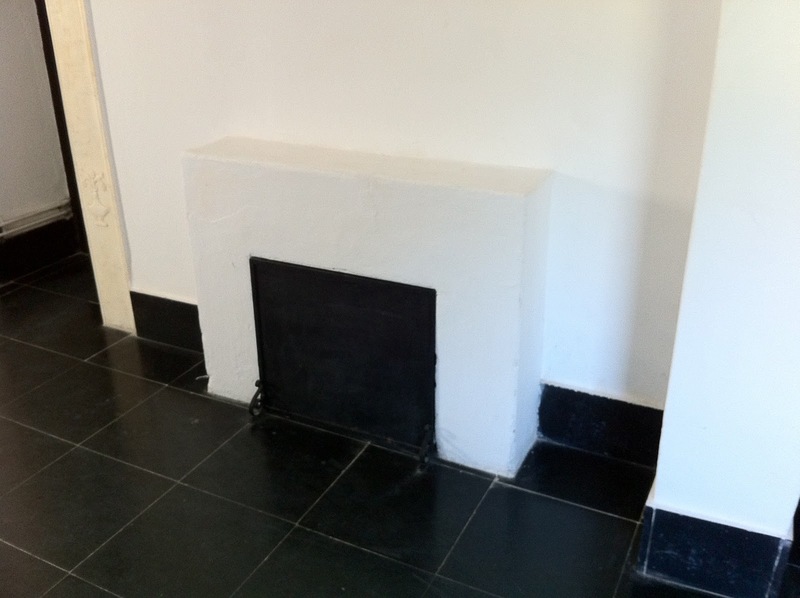 The fireplace in the second-floor bedroom; note the carved marble frame of the door to the bath. The uncrowned king of Hammamet, George Sebastian, dressed in a djellaba, circa 1940. 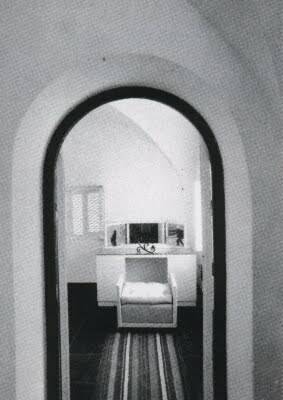 In the ground-floor master suite, the furniture—here an upholstered stool, presumably by Jean-Michel Frank, and dressing table—was sheathed in pale parchment set off by a colorful striped runner. The door frame, like much of the woodwork and wrought iron used in Dar Sebastian, is painted black. One of Dar Sebastian's bedrooms, as seen today. Image from Tunisia.com. 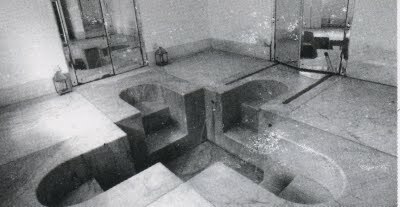 The extraordinary sunken marble tub in the ground-floor suite of Dar Sebastian; the bidet and sink are concealed behind the mirrored doors. The tub's shape interprets that of a sixth-century Paleo-Christian mosaic baptistry that is one of the treasures of the Bardo National Museum in Tunis. The marble-tiled swimming pool that occupies one wing of the house is bordered by arcades, distinguished by horseshoe arches supported by squat marble arches. Image by David Massey from "Maisons de Hammamet" (Dar Ashraf Editions, 1988). A closeup of the poolside dining table, made of black marble after the Ananas design by Jean-Michel Frank. The legs are fashioned of individual segments of marble. 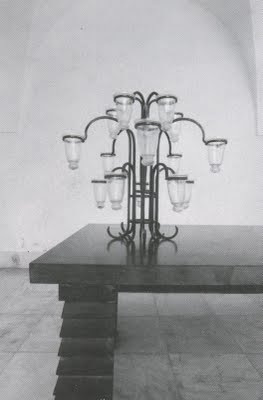 Standing on the table is a glass-and-wrought-iron candelabra. The Sebastians spent their marriage in glamorous transit, flitting between New York City, Wheeling, Paris, London, and Hammamet, with jaunts to Italy, Tahiti, Austria, China, and points beyond. The union, however, did not last, ending in divorce after Flora returned to the United States in the fall of 1936. The following year, in Paris, she took her third matrimonial plunge, marrying another younger foreigner, the fancifully named Eric Cipriani Dunstan, a British film critic and journalist known as the Golden Voice of Radio; Mrs Dunstan died in 1939, leaving her widower quite comfortably provided for. "[Ghrika] knew damned well what he was doing, he was only spending [his wife] Essie's money like water, that was all. Fortunately the old fart had taste. Except toward the last, when he was living in one room with all those nasty little boys. 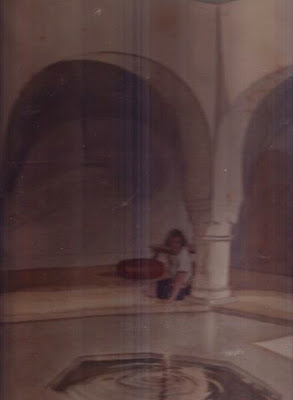 They used to pee in the courtyard fountain instead of using the john. Made the whole house stink." 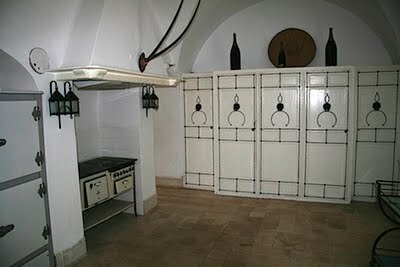 Dar Sebastian's kitchen, where the Sebastians' cook, Sadok, and chef, François Rysavy, reigned. 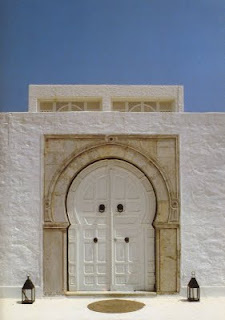 The doors and cabinets are painted white and decorated with nail heads in Tunisian fashion. The metal sconces are original to the house, as are the stove and refrigerator. Image from Tunisia.com. Documents suggest Sebastian's wartime life was quite a bit less collaborationist, however. Though Dar Sebastian was requisitioned during Nazi Germany's Africa campaign, and General Erwin Rommel, the Desert Fox, spent a few nights there, Sebastian had already absented the premises. He reportedly fled to Monterey, California, in 1939, upon the declaration of war, and did not return to Hammamet until 1946. Presumably some damage was done, because after the war, Sebastian "struggl[ed] to restore his villa to its avant-guerre perfection," according to an article published in 1947 in Town & Country. At some point he was joined by Porter Woodruff, who died of cancer in October 1959 at the house and in whose lush gardens he was buried. Three years later Sebastian sold the house of his dreams to the Tunisian government, which appointed him an adviser on historic restorations and turned Dar Sebastian into a cultural center. He died in Washington, D.C., on 9 March 1974, at age 77, the victim of kidney cancer. His will specified that his ashes be scattered at Dar Sebastian, as they duly were. What a guy!! I can only imagine all of the "extras" that George spent Flora's money on.......... But he was spot on with the JM Frank choices. Needless to say he had great taste and vision. Cream always rises to the top! There is really no way to prevent it! War, pestilence, plague, really nothing can prevent cream rising to the top! This is a perfect example! How fabulous and elegnt and decadent. I would give my teeth (well, maybe not) to have been able to spend a sultry weekend there as a papmered guest in its cossetted heydey. Oh, la! wonderful thank you... I must go see..
always a joy to see your stories.. There are some Louise Dahl-Wolfe fashion pictures taken in the house and around the courtyard pool for Harper's Bazaar c. 1950. Also, some interior photos in American Country Life in the late 1930s...I cant remember the issue date. The glass roof over the patio was by Lalique, and there were a number of decorative screens by Porter Woodruff. The other color in the house came from the yellow cushions in Mrs. Sebastian's "Moushararbie" latticed breakfast room. I found the CLA article, it's lovely. Dear Anonymous, Thanks for the tip about the "Country Life" article. I've purchased a copy of the magazine and hope to see it in my mailbox very soon. I did not know the article existed. Dear Anonymous, Until the issue arrives, would you possibly scan the article and email it to me? I'm so glad you were able to buy the CLA issue! I honestly can't muster the acrobatics it would require to attempt to scan the big bound CLA volume. I hope you also have luck with the Dahl-Wolfe photos. Your passion for design is always inspiring, thank you for giving me an outlet to share my knowledge. Thank you for the wonderful post and update! Amazing photos - both vintage & contemporary. Thanks for posting this. Wonderful. Nice work on Sebastian! Been there several times - in fact, every time I'm in Hammamet I get there to have a cup of tea by the pool or at the front of the villa...Who made the 3D sculpture of Sebastian at the kitchen? Nice work on Sebastian! Been there several times - every time I'm in Hammamet I get there to have a cup of tea by the pool or at the front of the villa...Who made the 3D sculpture of Sebastian at the kitchen? Thanks for a great and informative post. I am visiting Hammamet next week in search of my grandmother's childhood home, built during the same era as the Sebastian home. In that time it was known as the Fearnley Home. I was hoping you may be able to help me get in touch with Mr. Mehdi Sahli, as I believe he knew the family, or if you came across any information on the Fearnley home in your studies. Thank you!